As a Catholic, Marianist institution dedicated to providing answers to the global issues of our times, the University of Dayton's School of Engineering is excited to announce its 4th annual Academic Research Colloquium (ARC) for Ph.D. candidates and post-doctoral scholars. The theme of ARC is Research for the Common Good, in celebration of President Eric Spina's vision for the University. 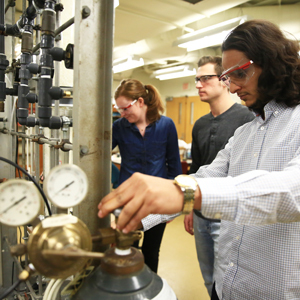 Our goal is to help provide avenues of opportunity for Future Engineering Faculty. Discover a university rich in opportunities for faculty, staff and students where diversity is a valued part of our commitment to creating an open, welcoming and inclusive campus. ARC is competitive, with a maximum of 20 all-expense-paid slots available. All travel, lodging and food expenses are paid. Applicants' research may be in early, formative stages; therefore, ARC is an excellent time to receive valuable suggestions and feedback from peers and faculty. Participants enjoy networking opportunities, tours of various research facilities on campus and participate in professional development workshops on interviewing for faculty positions, proposal writing and more. ARC attendees will discover a University rich in opportunities for faculty, staff and students. In keeping with the vibrant teaching and research atmosphere within the School of Engineering, our faculty, staff and students look forward to illuminating presentations by the competitively selected ARC graduate students. The overall ARC topic, Research for the Common Good, is intentionally broad to attract a wide array of promising research topics.